Faded red cardboard sleeve, about eight inches long. Made by Lawrence Engineering Services in Indiana. The company was making these in Wabash from about 1935 to 1938 when it moved to nearby Peru. Simple printed scales on wood with A [B CI C] D and no scales on the back of the slide. 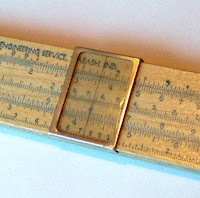 Type 8B is the 'B' version of their 8 inch sliderule. The 'A' is identical except that didn't have the reciprocal CI scale. The cursor or runner is celluloid in a stamped metal frame. 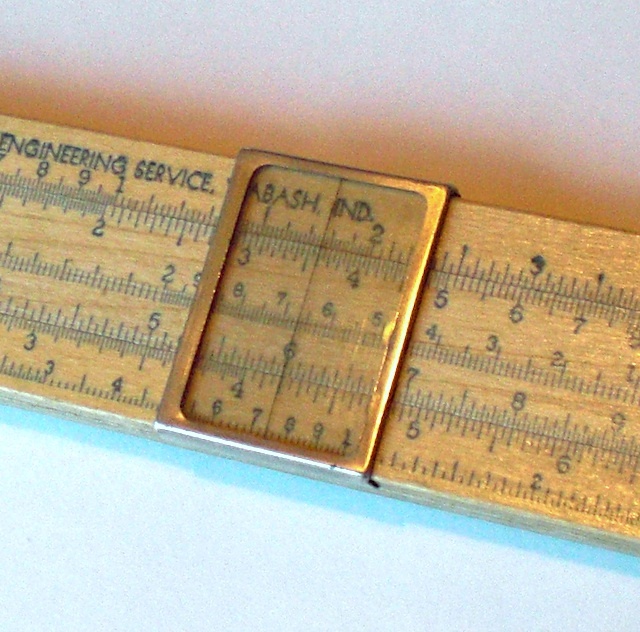 On the back there are very compact instructions on how to use the sliderule - very condensed small print. An amazing amount of correct information in a small space there! Very cool. So many things to collect, so little time, money and room! Many years ago, I started collecting ticket punches, staplers and fountain pens, because they take less room. Then I found an old saddle stapler, at least that is what I think it is. But it is cast iron, and has an 18" long handle, and is bolted to a 6" x 24" wood base. That's more room than a typewriter. I forgot about those. I think the one in my physics classroom was about 7 ft. long.